City councillors and politicians — who only hours ago were celebrating an Ontario Superior Court win — are reeling after Premier Doug Ford said he will invoke the constitution notwithstanding clause to override the decision. 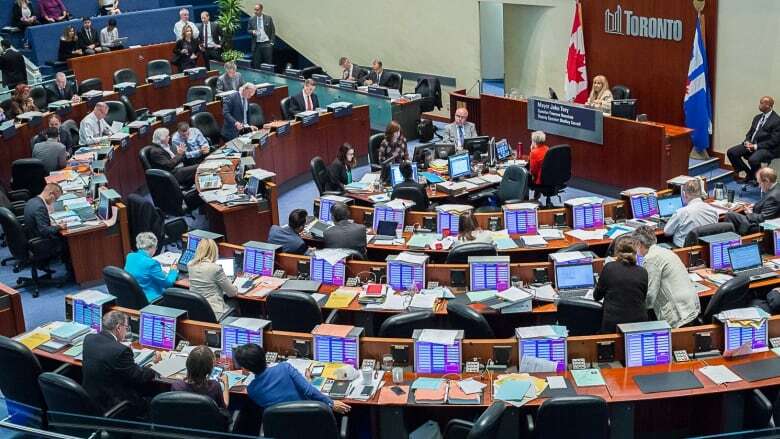 City councillors — who only hours ago were celebrating a win in Ontario Superior Court — are reeling after Premier Doug Ford said he will invoke the constitution's notwithstanding clause to uphold the law cutting the size of Toronto city council. "Overriding the Charter of Rights and Freedoms at a whim, when you've been found to be violating the constitutional rights of Ontarians, is absolutely terrifying," said Coun. Joe Cressy in a tweet Monday afternoon. "Doug Ford will use the Notwithstanding clause whenever he fails to get what he wants. The makings of a dictator." In an unprecedented and scathing decision, Justice Edward Belobaba ruled Monday that Ford's Progressive Conservative government "clearly crossed the line" with its Better Local Government Act, which aligns municipal ward boundaries with provincial ridings, cutting the number of councillors from 47 to 25 in the run-up to the Oct. 22 election. At a news conference Monday afternoon, Ford called the judge's decision "deeply, deeply concerning" on Monday and said he'll use the notwithstanding clause to override it. Attorney General Caroline Mulroney was not at the news conference Monday afternoon, but later tweeted her support for the premier's position. The dramatic step would make Ford the first Ontario premier to ever use the clause, which allows governments to uphold a law after the courts have ruled that it violates charter rights. He also threatened to use the clause again in the future, but didn't provide any specifics. Coun. Paula Fletcher called the whole situation a "roller coaster." "I'm absolutely shocked," Fletcher told CBC News. "Of course I'm never surprised by anything Doug Ford does against the city of Toronto because he seems to have a particular hate on for only the city." In a tweet, Fletcher called Ford's decision a "nuclear attack on the city of Toronto." This is a nuclear attack on the City of Toronto by Doug Ford. It is terrifying to think that he wants to override the Charter of Rights and Freedoms. We will keep fighting for our city and for local democracy. Before Ford declared he will use the notwithstanding clause, Coun. Kristyn Wong-Tam tweeted that an appeal of Ontario Superior Court Justice Edward Belobaba's decision would be a "steep uphill climb." "Respect the taxpayer and abort the costly appeal," she wrote. "Bill 5 is dead. Let it stay dead." Later, in an interview with CBC News, Wong-Tam said Ford is careless. "I think he's rogue. I think he doesn't believe in anything other than power and getting his way," she said. "Doug Ford is simply saying, 'I don't care what the courts are saying, I don't care if this law is unconstitutional — I'm going to do what I want because I happen to be the premier.' That's what makes him dangerous." Coun. Janet Davis said what is going on is almost like deja vu. "I almost feel like I'm having a flashback standing here ... standing in front of cameras when a Ford government does something absolutely outrageous," she said. "It is astounding to me that they are prepared to overthrow charter rights and a decision of the court in order to punish politicians at city hall." Toronto mayoral candidate Jennifer Keesmaat condemned Ford's decision and said it was "completely unacceptable to suspend the Canadian Charter of Rights and Freedoms in the pursuit of old political grudges. "We need to fight this suspension of the Charter vigorously, and with every legal means," she said in a statement. "And every Ontarian needs to understand how egregious and over the line this conduct is." Liberal MPPs Michael Coteau and Mitzie Hunter called Ford's decision "extremely disturbing" and "careless." NDP Leader Andrea Horwath said she is "astounded" and that Ford doesn't understand the role of the courts in a democracy. "[Ford] trampled on people's Charter rights with Bill 5...And instead of finding a way forward that respects people's rights, Mr. Ford is just taking those rights away," she said at a news conference immediately after Ford spoke to reporters. "You're not the King of Ontario, Mr. Ford. You may have been elected with a majority government, yes, but we are living and functioning in a democracy, and you'd better look it up." Green Party leader Mike Schreiner said he is "shocked and disappointed at the lengths this premier will go to in his apparent personal vendetta against the City of Toronto. "That Premier Ford would choose to use the Notwithstanding Clause in this way shows his arrogance and contempt for democracy," he said in a statement. "The Premier has shown that he is more than willing to create chaos and break the bank on lawyers to get what he wants." Jamie Ellerton, a conservative strategist, urged Ford to move on from the council cuts and focus on the many other needs in the province. $12 billion deficit. Hallway healthcare. Falling math scores in schools.<br><br>Throwing more money at lawyers and courts to make up for a needlessly rushed process (or lack thereof) will fix none of those things. Rachel Curran, a former lawyer and former director of policy for former prime minister Stephen Harper, said in a debate on CBC's Power and Politics that she supports Ford using the notwithstanding clause to send a message to the judiciary. "I'm glad that a premier in Ontario has finally said, 'I am going to use this clause in the charter,'" she said. "[The clause] is expressly designed for this purpose, to uphold legislation that's supported by the democratically elected premier of the province." Curran was not speaking on behalf of Ford, nor does she work for his government. Ontario Municipalities Minister Steve Clark also took to CBC's Power and Politics to defend the decision to cut council.